The Clintons will join New York Mayor Michael Bloomberg and thousands of others watching the ball drop on New Year's Eve in Times Square Wednesday night. Last New Year's Eve they were in Iowa. This year, Sen. Hillary Rodham Clinton and former President Bill Clinton will be in Times Square, helping Mayor Michael Bloomberg lower the glittery New Year's Eve ball. The Clintons will lead hundreds of thousands of revelers in the final 60-second countdown and push the ceremonial button that lowers the ball, ending their roller-coaster year that saw the former first lady lose to President-elect Barack Obama but be named secretary of state. Up to a million people are expected Wednesday to wait for the clock to strike midnight, with the forecast calling for snow and temperatures in the low 30s. Portions of the event will be televised live on ABC-TV and other networks. 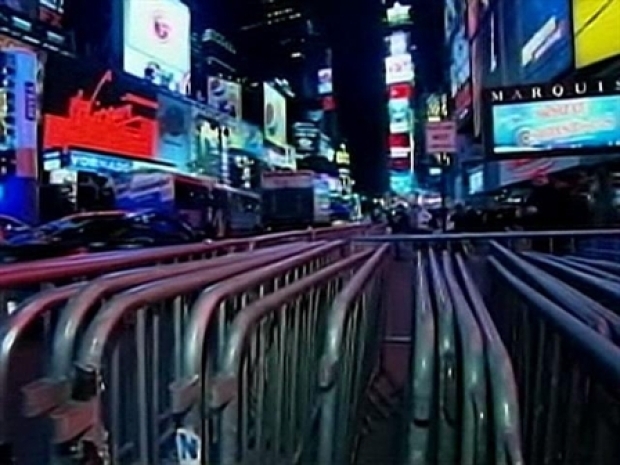 The crowds are already gathering for the big New Year's Eve bash in Times Square. Mayor Bloomberg swears it'll be one of the safest spots in the city. And if you're thinking of going, make sure you leave your car at home! Five minutes before midnight, 1,000 balloons with the words "Joy," "Hope" and "2009" will drift down from rooftops in the area. More than a ton of confetti will be released at midnight. The Waterford crystal ball -- some 12 feet in diameter and weighing nearly 12,000 pounds -- will remain on display atop One Times Square as a tourist attraction after the event. Security will be tight, with a large police presence and additional counterterrorism units, said Paul Browne, the NYPD's deputy commissioner of public information. Streets will be closed off to traffic, backpacks won't be allowed into Times Square and alcohol is forbidden. "I have no concerns other than we always have concerns," Bloomberg said Tuesday. "There's no reason why anybody should stay home, I'm going to be there... I would urge everybody to be there." The first-ever Times Square celebration was held in 1904 to commemorate the official opening of the new headquarters of The New York Times. The city had just renamed the oddly shaped Longacre Square in the newspaper's honor and the newspaper's owner, Adolph Ochs, threw a giant party that culminated in a fireworks display at midnight. In 1907, after the city banned fireworks, Ochs had an illuminated iron and wooden ball lowered from the building's flagpole at midnight.